Being a artist for 12 years I know how hard it is to get exposure. I am a true believer in every little bit counts so I decided to do something. When I created the Ease Dropping Show I wanted to showcase artist. While filming my show members on my team wanted me to charge artist to be on my show. Of course I wasn’t going. I separated myself from that situation quick. My name means a lot to me when it comes to business. I don’t want to take people money for a service that I wanted to offer for free. I had to start all over with my show. I had to get a new team a new business plan and all but it was the best move ever. While writing out my plans I decided to go harder for artist by promoting them 24/7 on huge social networks. Yes it a huge task to pull off but I love the feeling that runs thru my body when I help somebody. It is no greater feeling then to show love. Over the years my fan base has grown with hard work and dedication but I had people spreading the word about me that helped me majorly. 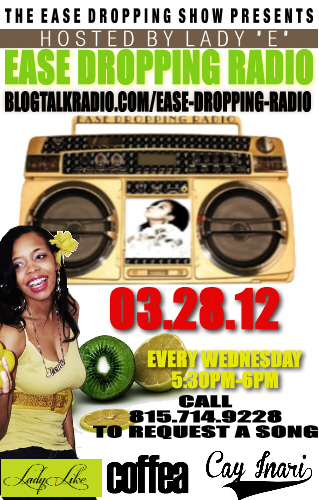 Ease Dropping Radio on blogtalkradio.com is another way I can play indie music to my fan base. I’m excited and extra busy but I won’t have it any other way. If you are interested in Ease Dropping Promo send all media kits and contact to easedropping@gmail.com. I will respond to you as soon as I can.